4.5 star review.If you want to gain insight into the extraordinary human diversity of Hawaii, this is a fantastic read. This one volume history, now 40 years old, covers Hawaii from Captain Cook’s arrival to Barack Obama’s birth. I found the book to be highly informative and very well written. Because it covers so much, the stories are at best vignettes but there are so many nationalities represented in Hawaii’s history that it is absorbing. The middle to latter portions of the book are well documented, the earlier portions are thinly referenced but that is to be expected. If you want to understand the role that the missionaries played or if you want to know what a horrible person Sanford Dole was, this book tells some relatable stories. While the book is not written from a native Hawaiian perspective it harbors a good deal of disdain for the white American imperialists, justifiably I might add. Otherwise 5 stars, but a little dated. This book is widely considered to be the definitive text when it comes to the modern history of Hawai'i. Certainly, no other text attempts to take on such a broad swathe of history in such detail. If you're interested in the history of Hawai'i and/or the imperialist history of the U.S. in the Pacific, Shoal of Time is a must read. However, beware, I found that the book has some pretty big flaws.First of all, every historical account can only be told from the perspective of the historian who tells it, and this historian is definitely one who has an "all's well that ends well" point of view about the colonization of Hawai'i and all that was lost in the process. In addition there are some historical inaccuracies and exclusions that make a real difference to one's understanding of just what, exactly, happened here.On the second point, Daws gives short shrift to what many refer to as the "Great Dying," the historical sweep of 80 or so years during which more than 95% of the Hawaiian people died, due largely to contracting diseases brought to Hawai'i by it's colonizers and to which Hawaiians had no immunity. This catastrophe could not but have shaped the worldview of the Hawaiian people, including our relationship to our religion and religious leaders, opening the doors to many significant changes that are presented as though they were easily chosen by Hawaiians. For instance, when everyone around you is dying, you might think your gods were failing you, making the notion of trying on a new god or two kind of appealing, especially when the missionaries bringing you the word of said god are taking advantage of the situation and suggesting that you are all dying of sin.Also on this point, Daws at one juncture suggests that plantation life in Hawai'i was similar to that of the antebellum southeastern U.S. but for, though not in so many words, the slavery and threats to white women by black men causing unrest and acts of retaliation like lynchings. I accept that slavery is different than peonage, which is more along the lines of what immigrant workers experienced in Hawai'i, but the notion that lynchings in the south were acts of retaliation is just b.s. The whole notion of the sexually depraved black man is a myth created by white men in the south in order to justify acts of violence that were really committed in order to intimidate slaves and prevent them from rebelling (not to mention subsequent generations of African Americans in order to quell challenges to white supremacy). I'd call that a pretty big gaff, and one that reveals a lot about the Daws point of view on issues of race. That point of view comes across now and then throughout, though I believe unintentionally. But, again, all in all, no other book goes as far, nor into as much detail, at least where English language resources are concerned, as this one. For a history of Hawai'i that delves into Hawaiian language resources which tell a very different story, check out Aloha Betrayed by Noenoe Silva in my books. Hands-down the best one-volume political history of modern Hawaii ever written. It's difficult to write a history of the islands since Captain Cook's arrival through US annexation and statehood without "taking sides" in the struggle between the natives and haoles - and the book's point of view definitely does have its clear heroes and villains - but Daws makes an honest effort to provide context for all the warring factions in the book and avoids turning it into a one-sided screed as it could have been. Two warnings to prospective readers. One - this is a political history, not a cultural one, so don't read it to learn about native customs and traditions. Second - the paperback edition has no pictures, maps or illustrations; and this is a book that would deeply benefit from having them.These caveats aside, the book is highly recommended to anyone with an interest in the history of Hawaii from 1778 to statehood in 1959. 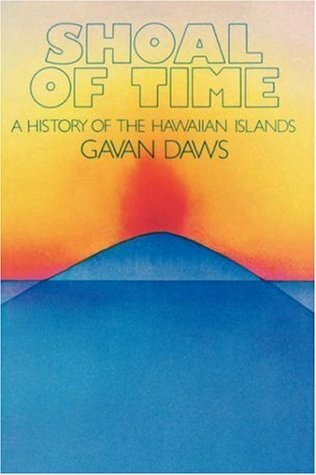 "Shoal of Time" is an "ok" introduction to Hawaiian history, thorough in some areas, but glaringly thin and/or dated in others. Only recommended for background reading as part of a broader palette of histories, texts and cultural texts offering differing viewpoints.Other books and historical texts that I recommend for a more complete cultural and historical view include:"The Voices of Eden"All Volumes of "The Hawaiian Journal of History" (Hawaiian Historical Society)"For Whom the Stars""Must We Wait in Dispair? "Anything written by Mary Kawena Pukui but particularly including: "The Hawaiian Dictionary" "The Polynesian Family System in Kaʻu" "Place Names of Hawaii"Handy, Handy and Pukuiʻs "Native Planters in Old Hawaii""The Fornander collection of Hawaiian Antiquities and Folklore", Volumes IV, V and VIAnything written by Samual Kamakau but particularly: "Ruling Chiefs of Hawaiʻi"Anything written by Patrick Vinton Kirch but particularly: "On the Road of the Winds" "A Shark Going Inland Is My Chief: The Island Civilization of Ancient Hawaiʻi" "The Evolution of Polynesian Chiefdoms""Unwritten Literature of Hawaii""Hawaiiʻs Forgotten History""Voyage of Rediscovery""An Ocean in Mind""We the Navigators""Nā Inoa Hōkū""Presstime in Hawaii"Bishop Museum BulletinsIʻm missing a ton of other titles and authors that should be on this list including several covering the plantation era, post-world war II and Hawaiian renaissance but the above is not a bad start. After living in Hawaii for 4 years, I got sick of not being able to answer questions from friends and family about the history of the islands. I was looking for a readable book that would take me from Captain Cook to statehood, which is exactly what Daws has written.When I was looking for books, a found a few reviews of this volume that said it was biased against Native Hawaiians, so I was cautious when I started reading. After getting through a few chapters, I realized that the problem is not that Daws is unfair to Native Hawaiians, but that he is brutally honest about all parties involved in Hawaii's complex history. For every time he points out a poor political decision made by the Hawaiian monarchy, he also makes sure to note that many of the white business men were racist, self-interested, and narrow-minded. Rather than take sides, Daws seems interested in helping the reader understand that the annexation and Americanization of Hawaii was not as black and white as people today like to think. He does a good job exploring the complex and long-lasting relationship between Hawaiians and Europeans and explaining how the intersection of multiple political motivations resulted in statehood. Regardless of how you feel about Hawaii's history, this book is a good read. Daws paints the picture of a thriving, impressive culture that is (perhaps prematurely) thrust on to the Western political stage and forced to adapt. Both good and bad come of it, and I think any student interested in Hawaiian history should read this book if only to understand that the path to take was not always obvious, and that the characters involved were not inherently good or inherently bad. Shoal is the history of the Kings of Hawaii from Kamehameha 1 to the end of the monarchy in the late 1900s. The story is true, but the events are incredible and compelling. How the Hawaiian Islands were discovered and eventually subverted by the US and the European powers makes for great storytelling. Damn that was a long book. I enjoyed the ancient history the most as that is where my interests are. Even still it is useful to have read this book as a way of understanding Hawaiian culture today and much of the animosity directed at Haoles. Shoal of Time may be tedious at times, but it's also incredibly comprehensive and fascinating. It took me weeks to make it through this book, and in the process, I created dozens of bookmarks for research purposes. The approach of the book feels very fair in its treatment of haoles (whites), native Hawaiians, and the islands' history of misunderstanding, racism, and political corruption. It goes into detail on the first arrivals of foreigners, to Kamehameha, to the takeover of haoles and sugar companies and American annexation, to the attack on Pearl Harbor, to Hawaii gaining statehood. I had no idea that statehood was delayed for years because Hawaii, with its heavy populations of "foreigners" and union labor, was regarded as a hotbed of communism. The book contains a lot of interesting data like that.While the book did require skimming in spots, it was a good read overall, and I can see why it has stayed in print for decades. I bought this book back in 2004 while I was in Honolulu, laid up with terrible sunburn.It is THE book on Hawaiian history since their "discovery", tracing the political and cultural history of the islands from their first western contact to the modern day. If flying to Honolulu from the east coast, you're going to be on a plane for 12 hours and you'll likely be wide awake. Read this book, your tour guides aren't that complicated. Also, for terrific and cheap surfing lessons anywhere on Oahu, call my groovy buddy Roger: 808-734-4558 (cell).Aloha! Don't read this if you are white and want to enjoy Hawaii. It may very well take all the joy out of it for you. Very well chronicled and very acurate. There is a byast against the white man, (for good reason.) Written by an Australian used as a Text book in Hawaiian History classes today but reads like a novel. Gavan Daws knows his Hawaiian history and he knows how to write. Shoal of Time is a mesmerizing survey of Hawaiian history from the days of Kamehameha to the modern era.This is not the most detailed look at Hawaiian history, but it is a reader-friendly introduction to a long and fascinating tale. Dated but, in its day, simply the best introduction to the sald bowl in the Islands. This might be the original "comprehensive" history of Hawaii, but boy is it a dull and tedious read. I did appreciate how much ground Daws tries to cover, as many other Hawaiian histories focus on the short-lived monarchy and the period of annexation, whereas he covers the pre-Captain Cook era through the granting of statehood post-WWII. However, his monotonous litany of facts, unbroken by nary an interesting anecdote, made it difficult to absorb the information or concentrate on the text for long periods of time. I also found Daws' skimming of certain historical periods a strange decision; Liliuokalani is only given a bit part, for example. Perhaps his treatment of Liliuokalani is symptomatic of his necessarily limited perspective as a white male writer; indeed, I found Daws' treatment of non-white and/or female historical figures problematic, as many of them are presented as caricatures, or (in the case of the women) hardly acknowledged at all. If you're trying to see how scholars have documented Hawaiian history differently through the ages, your sort of have to read this book. But if you're just a regular reader looking to know more about the history of Hawaii, I'm sure you can find a less biased (and more entertaining!) modern read. A must read, recommended to me by my Lomilomi teacher. Don't base your sole knowledge of Hawaiʻi on Michener's rambling tome. I think a Hawaiʻian might say, 'Go to the source and sip from that spring.' This book can give you insight into the consequences of island history that has ripped resources from the land and the land away from the indigenous people. It is not presented as if their own Aliʻi and Monarchs had no faults, but you can see how Mainland thoughts of the islands are still based on an inaccurate foundation. This book will help you understand the upwelling of Hawai'ian activists as they try to protect sacred peaks from telescopes, sacred springs from subdivisions, and the health of their children from global corporation chemicals. Actions that could save Hawaiʻi, might save the world.Mālama ʻāina, mālama honua. I enjoyed using this book as a reference when in my sociology class. I married into the Hawaiian race and have made it 'part of my home' with the birth of each of my four daughters. I will continue to read the reviews as they seem so accurate. My study of Hawaii is short but I find it fascinating and hope to take measures to learn more of Daws and others who have expended a good amount of time in the name of leverage for Hawaii and its people. This is the only book on Hawaiian history I've read so I can't compare it to other similar works. However I can't imagine a better one-volume survey that covers over a century and a half of history into less than 400 pages and does it with as much detail as this. It's a very readable account that touches on a vast array of sub histories and historical events worth going deeper into. It's also a rather breathless sprint despite the level of detail Daws manages to pack in. Daws covers Cook's sighting of the islands in 1778 to statehood in 1959. He covers the political history of the kingdom, the epidemics and missionaries, the ever-increasing foreign pressure on the Kingdom, the whaling industry, the sugar and later pineapple industries, military considerations, the role of foreigners in saving and then sabotaging the Hawaiian kingdom, the growth of Chinese/Japanese/Filipino populations, the organization of labor, the Communist witch hunts, the territorial status of Hawaii post-annexation, among many other topics.I'd heartily recommend this book for those interested in a single-volume history of Hawaii. Keep in mind most of the action occurs on Oahu and in Honolulu, with less and less coverage of the other islands as the book goes on. A solid introduction to the history of Hawaii, but it is very slow-going. My reading may have suffered by comparison with Taylor Branch's Parting the Waters: Martin Luther King and the Civil Rights Movement 1954-63, which I had just finished before picking up Shoal of Time. But Parting the Waters is triple the length and took me half the time to finish.Shoal of Time wanders, and Daws is not good at contextualizing events and, particularly, people. He'll suddenly drop in a paragraph-long list of the members of some committee, then reference one of them 30 pages later without any reminders. He also never truly defines terms, and without a glossary, I found myself going to look up things like "kapu. "Still, I learned a lot and I think Shoal of Time is a good introductory volume. I just wish it had been a bit easier to read. Chills by the endThis book was slightly tedious at times but overall I must say, is an excellent review of the history of Hawaii from its origin to early statehood. At the age of nearly 60, I was blessed withe the opportunity to visit Hawaii for the first time in late February 2016. The history provided in these pages has enriched my plentiful and pleasurable memories of our visit. The author's conclusion brings renewed hope for me to our present political scene. Hawaii is a prime example of many races being brought together, often without consent, but with eventual mixing, melding, acceptance, and progress, to the point of we, the community of Hawaiians. In our present times of great splits and disagreements, we as Americans need to figure out how we are going to move ahead together to provide our children and grandchildren with a safe and healthy future. Great history. A daunting read but worth it. Oddly, as a person who's ohana calls Hawaii home at least part of the year, its taken me a long time to read this. Its a history book, first and foremost. It doesn't read as a novel and that said can be occasionally tedious. It is written largely from the haole perspective & I realize this is a change for me. I've almost entirely engaged Hawaiian history from the indigenous point of view. But I enjoyed having this different perspective even if st times I found it insensitive, aggravating, or just plain wrong. I would suggest pairing this with Liliuokalani's book to provide balanced, bookended perspectives. A great historical work however. Accurate, thorough & detailed. Excellent, comprehensive look of European-Hawaiian history. Starting with Cooks discovery and leading up to statehood, it follows the key players in politics and economics- following the establishment of Kamehameha's kingdom, the British overthrow, the US backed overthrow and then eventual the quest for statehood. The author takes a fairly non-bias stance in most of the events, stating what is popularly understood to have happened and letting the reader decide either way. A note of caution though- this book is very difficult to read due to the extensive use of dates and names, especially if you are not familiar with the Hawaiian language. This is the seminal Hawaii history. At 500 pages, I originally that it would be too much detail, but as I read the events I was familiar with, I realized that the author had restrain himself from providing too much detail. Daws has captured nearly all significant events and people from Cook's initial contact through statehood. Sadly, the recurring theme of the last century's history has been racist prejudices. Despite these blemishes, Hawaii has been a pretty good place for most people. A solid, readable introduction to the history of the Hawaiian islands. It's pretty depressing stuff -- racism, colonialism, the illegal U.S. annexation, strike-breaking, Pearl Harbor, internment, McCarthyism... -- but certainly interesting. The book was written in 1968 and contains some inevitable biases (and regressive word choices). Daws doesn't even TRY to address women's experience and role in Hawaiian history. Nonetheless, it was a clearly written and informative overview. A fascinating, if lengthy, synopsis of Hawaiian history. A bit slow at times, and also sounding in parts rather dated, it nonetheless is informative and worth reading.A word of warning - Daws has a sharp pen and frequently writes from an ironic stance. If you (or your students) are not attuned to his sardonic comments, they can come across as crude or condescending, but they are clearly not intended to be so. Took me a while, but it's done. Liked a lot the first 100 or so pages with the accounts of Cap. Cook journeys. Was ok in the middle, but it was an effort to finish the later parts due to them being too much (for me at least) of a political accounting regarding the relationship with US (and the statehood process). i am half-hawai'ian. i can only wish i had read this book before, or that it was taught in freshman high school in the islands, when we lived there. i only wish somebody would take up the responsibility to fill in the years since this text was written. somebody does not mean necessarily hawai'ian- but it might help. Always been fascinated by Hawaiian history. Shoal is a fast paced narrative that reads like a novel. It was however excruciating to read about the first Hawaiian missionaries. Hard to believe what's been done and said in Jesus name... If you are at all interested in Hawaiian history it's the perfect book. In the brief time I lived in Hawaii, I found that not a single person I met knew anything about the island's history, nor anyone even remotely interested in doing so. This book is an excellent tale of the outside world's contact with the islands, beginning with the first contact by Europeans. An excellently told, well written read. This history of Hawaii is engaging and interesting. This book is not. However, I managed to slog my way through it. The research is excellent, tone unbiased, it's just a bear to get through. I fell asleep so many times while reading this one. When I lived in Hawaii and people told me they were planning to visit, I always recommended that they read this book first. I credit its reading for my being welcomed with aloha to the Islands -- and striving to treat that special place and its people with holiness and happiness.